I had my community service this morning (finally, Christmas break!) and I decided to drop by this ukay near my house. I’ve been seeing it for several months now but I only had the guts to check it out now because I thought it was a relief goods center because there were so many clothes and it was inside the court of a village park. 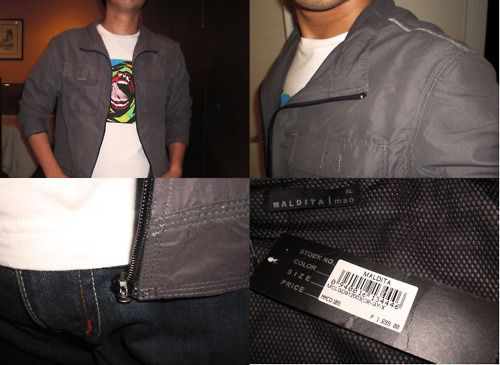 I found this summer jacket from Maldita Man and I got it for P200. What’s amazing is that it still has its tag (original price is P1,699). The zipper’s broken and it’s going to cost me P150 to repair, but what the hey. P350 is nothing compared to P1,699. If you’re from the south, the ukay is in the park of Philam Village. They sell bags, jackets, shirts, and jeans and some of them still have their tags and are still sealed. Brands include Penshoppe, Oxygen, Esprit, etc. I’m not sure where they get their clothes and I didn’t want to ask because they might be a syndicate and they might cut my fingers off if I “snoop” too much. They’re staying there until the end of the month so you better go there ASAP.